Get gig-ready power and great tone from a head that fits on your pedalboard. 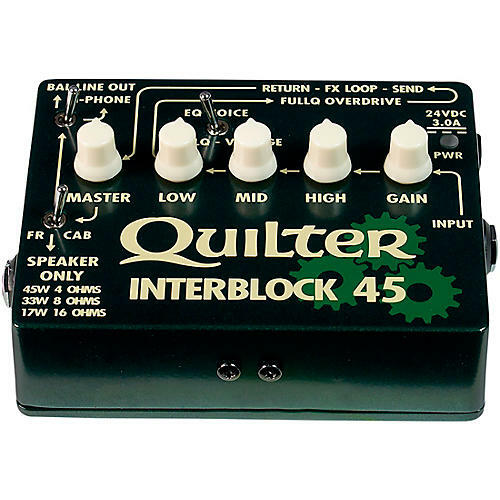 The Quilter Labs InterBlock 45 delivers up to 45 watts power for your cabinet from an amp the size of a pedal. It's enough power to give your pedals, your modeler, or anything that needs to be heard in a serious gig. Find yourself on a stage where cabs are not allowed? Don't sacrifice tone! Plug in your InterBlock 45, and select the Balanced Line Output, then choose FR or cab sim to give your PA the same luscious life and tone that you give your speakers. Dimensions: 1.75" x 4" x 5"